At Aralco, we are constantly listening to our clients and their needs for using new technologies to see where and how they can benefit their operations. With the advancement of inexpensive, portable/mobile hardware such as iPads and tablets, using Apple, Android and MS Surface and other smart phone technologies, clients are faced with the need for more affordable availability of their data and reports for quick access. Product look-ups are useful in retail stores, showrooms and warehouses to better serve customers and for sharing product images, price and other information simply using your mobile device and without the need to have access to a desktop computer. Real-time inventory look-up for one or ALL store and/or warehouse locations. Customer Look-up Ability to look-up customer details and sales history. Physical Counts Physical Counts can be done with Bluetooth scanners which can verify the product information instantly including product image and other relevant information. 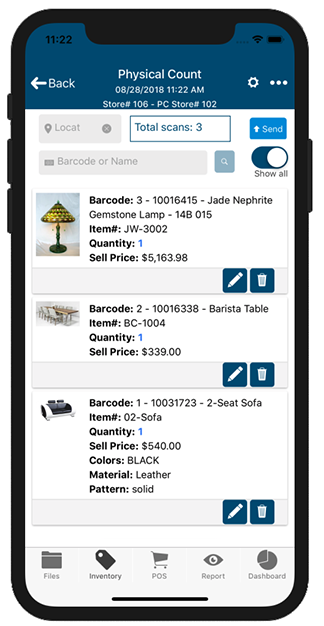 Mobile features also include inter-store Transfers, Goods Receiving, Discounts, all within a simple yet functional POS application. Click here to view the Aralco Dashboard functionality. 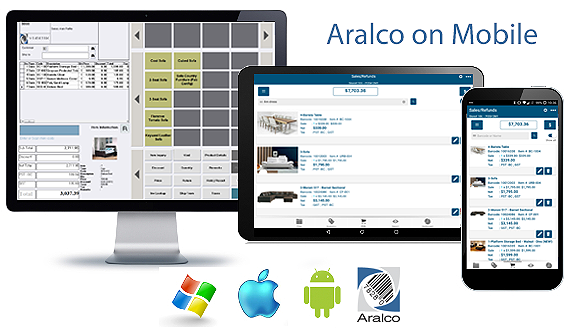 Click on the Android or iOS icons below for the Aralco Mobile APP.